The wealthy are looking outward, but there are still disconnects, often generational, between intention and action. 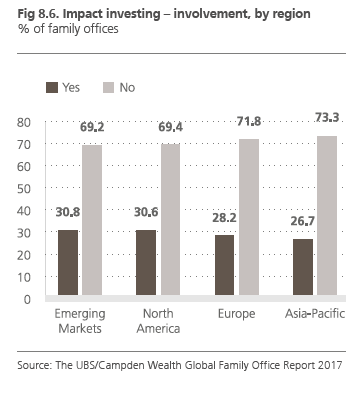 UBS' recently released 2017 Global Family Office Report, which surveyed 262 family offices of various types worldwide on an exhaustive variety of subjects, reveals that family offices are increasingly engaged in philanthropy and social and environmental impact endeavors. 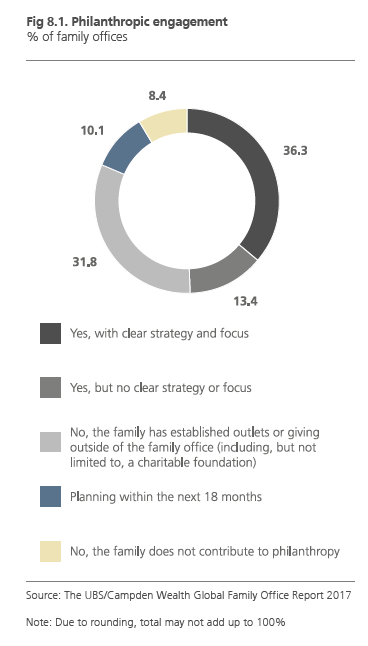 Overall, some 60 percent of surveyed family offices either currently manage families’ philanthropic activities or plan to do so within the next 18 months. Of those, almost 95 percent plan to either maintain or increase their current philanthropic commitments within the next year. And that generational shift is bearing down fast. Creating a succession plan is the surveyed families’ top priority—69 percent expect to undergo a generational transition in the next 15 years. Interestingly, there’s a fairly clear-cut divide in how these families plan on handling that incoming transition of power. Nearly 36 percent expect to follow the “traditional” path and have the next generation directly take over the family office. However, almost 31 percent are planning on handing the reins over to a nonfamily professional, with the next generation simply providing occasional oversight, a route that even only a decade ago was still somewhat sacrosanct. Ultimately, facilitating the transfer of intergenerational wealth is the primary purpose of most family offices, and family offices seem to be taking an increasingly outward view, both in terms of who will manage that wealth on a day-to-day basis and to what aims it will be put.